We assume multidevice ownership. i.e.. people will use increasing number of device to access their content and applications. We argue that this transition to multiple device ownership will eventually lead us to liquid software – an approach that will allow data and applications to seamlessly move between multiple devices and screens. The new era will imply significant changes in the development, deployment and use of software, opening up new opportunities in software engineering research as well. 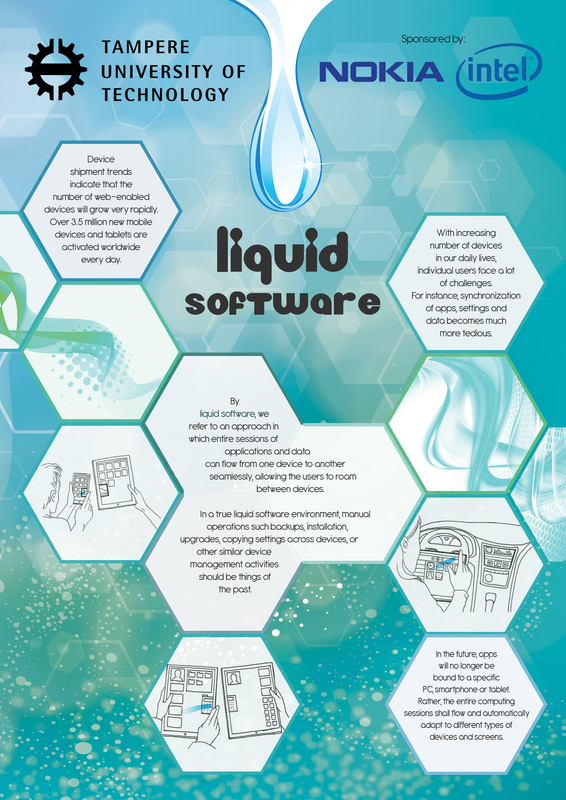 These pages are about our research on topics that make liquid software a reality. In a truly liquid multi-device computing environment, the users shall be able to effortlessly roam between all the computing devices that they have. Roaming between multiple devices shall be as casual, fluid and hassle-free as possible; all the aspects related to device maintenance and device management shall be minimized or hidden from the users. The user’s applications and data shall be synchronized transparently between all the computing devices that the user has, insofar as the application and data make sense for each device. Whenever applicable, roaming between multiple devices shall include the transportation / synchronization of the full state of each application, so that the users can seamlessly continue their previous activities on any device. Roaming between multiple devices shall not be limited to devices from a single vendor ecosystem only; ideally, any device from any vendor should be able to run liquid software, assuming the device has a large enough screen, suitable input mechanisms, and adequate computing power, connectivity mechanisms and storage capacity. The user shall remain in full control regarding the liquidity of applications and data. If the user wishes certain functionality or data to be accessible only on a single device, the user shall be able to define this in a simple, intuitive fashion. Q1: Is Liquid SW a new technology? Liquid SW is not a technology. It is a vision of seamless and fluent experience for people using multiple devices for accessing the content and applications. Research on Liquid SW will analyze and develop several supporting technologies including UI adaptation, efficient data synchronization, and moving running applications (with local state) from one host to another. Q2: Is this same think as Apple’s Handoff or Nextbit’s Baton? Both Handoff and Baton are good examples of Liquid SW. However, they are limited to certain operating systems? The office tools in Google Docs are good examples of applications that can be used from several devices. However, these applications do not adopt to different devices and different usage context. Also, these services do not have any easy way to transfer the work easily from one device to another. Q4: Is Liquid SW especially for Web and HTML(5)? Not necessarily, but Web and HTML5 are the most promising approach for Liquid applications that utilize devices from different ecosystems.